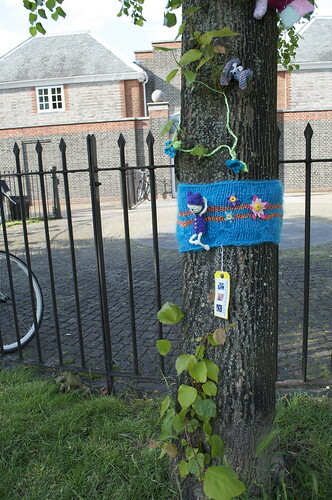 Its been 2 months since the birth of my daughter, baby button and its been far too long between yarnstorms. 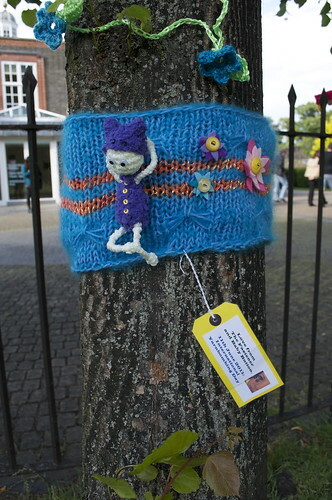 With International Yarnbombing Day and Stitch London’s Stitch Crawl approaching on the 11th June, I knew I had to get my creative knit on and create something to go alongside the flutterby’s that Stitch Londoners were busy creating in homes across the capital. The recent sunshine and beautiful summer days encouraged me to create a cheeky chap chilling out in the sun, lying against a tree watching the flutterbys float all around him. a saturday afternoon, surrounded by sunshine, butterflys and flowers, what more do you need? It was just typical that baby button wasnt too impressed by my graffiti and decided that she’d had enough just as I was trying to sew my piece to the tree! 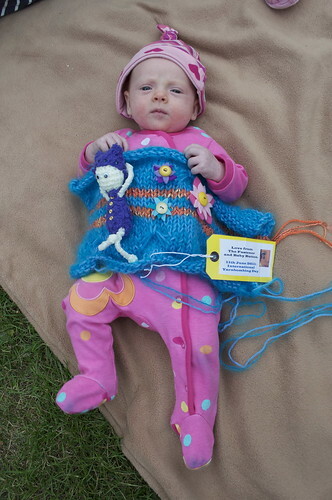 Possibly the youngest yarnstormer ever? 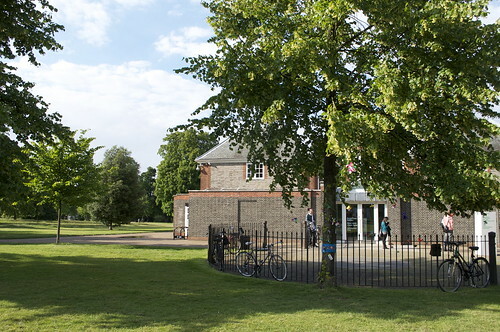 22 Jun	This entry was published on June 22, 2011 at 1:21 pm. 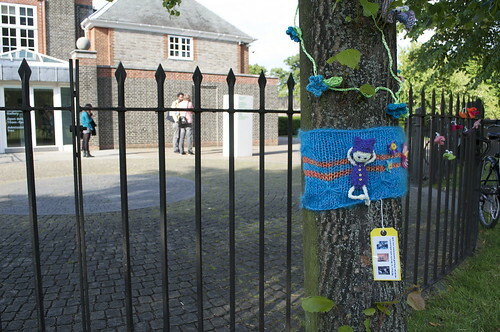 It’s filed under Amigurumi, I made this!, Knitting, Yarn Storms and tagged Amigurumi, art, craft, crochet, graffiti, guerilla knitting, knit the city, knitting, knitting graffiti, stitch london, street art, the fastener, yarn bomb, yarn storm, yarnbomb, yarnbombing, yarnstorm. Bookmark the permalink. Follow any comments here with the RSS feed for this post. What a sweet little ‘cheeky chap’, shame baby button got bored! I know what you mean about babies stealing knitting time – Babybee is 3 months old now and I’ve barely had time to pick up the needles since she got here. But alas, you do have to start ’em young.. I will immediately grab your rss feed as I can not in finding your email subscription link or e-newsletter service. Do you’ve any? Kindly allow me understand so that I may subscribe. Thanks. Hi, the subscribe button is on the right. Sorry you had trouble. Thanks for visiting.